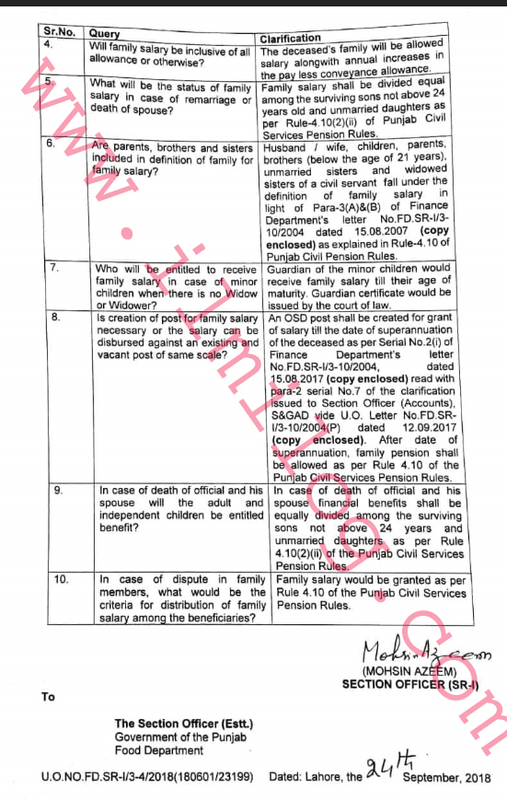 U.O NO.FD.SR-U3-4/2018/180601/23199) has issued a clarification by the government of the Punjab finance department on 24-09-2018 regarding Death Benefits 2018 for Civil Servant Jobs Finance Department Punjab. Query No. 1: Which Authority will sanction/authorize family salary in case of during service death of an official/officer? 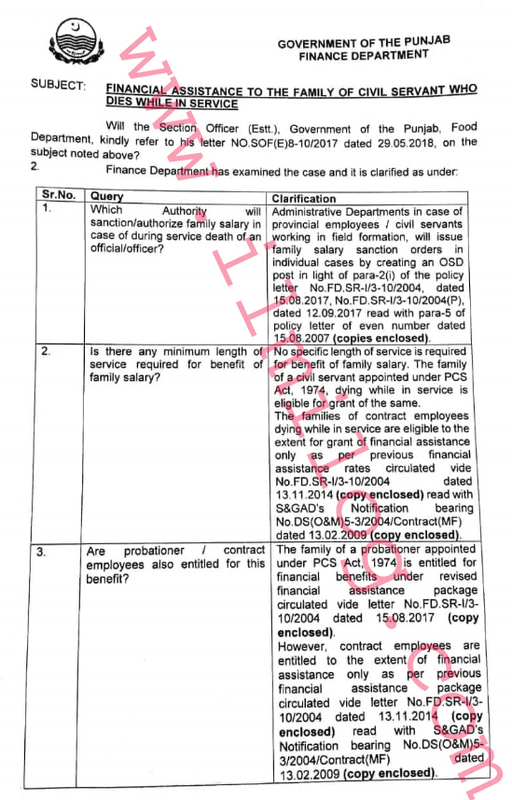 Administrative Departments In case of provincial employees / civil servants working in field formation will issue family salary sanction orders in Individual cases by creating an OSD post in light of para•2(i) of the policy letter No.FD.SR-113-10/2004, dated 15.08.2017, No.FD.SR-1/3-1012004(P), dated 12.09.2017 read with para-5 of policy letter of even number dated 15.08.2007 (copies enclosed). Query No. 2: Is there any minimum length of service required for benefit of family salary? No specific length of service is required for benefit of family salary. Under PCS Act, 1974 the family of a civil servant appointed, dying in service is eligible for a grant the same. The families of contract employees dying in service are suitable to the extent for grant financial assistance only as per previous financial assistance rates circulated vide No.FD.SR-I13-10/2004 dated 13.11.2014 (copy enclosed) read with S&GADS Notification bearing No.DS(O&M)5-3/2004/Contract(MF) dated 13.02.2009 (copy enclosed). Query No. 3. Are probationer/contract employees also entitled for this benefit? The family of a probationer appointed under PCS Act, 1974 is entitled to financial benefits under revised financial assistance package circulated vide letter No.FD.SR-I/3- 10/2004 dated 15.08.2017 (copy enclosed). However, contract employees are entitled to the extent of financial assistance only as per previous financial assistance package circulated vide letter No.FD.SR-I/3- 10/2004 dated 13.11.2014 (copy enclosed) read with S&GAD's Notification bearing No.DS(O&M)5- 3/2004/Contract(MF) dated 13.02.2009 (copy enclosed). Query No. 4. Will family salary be inclusive of all allowance or otherwise? The deceased's family will be allowed salary along with annual increases in the pixy less conveyance allowance. Query No. 5. What will be the status of family salary In case of remarriage or death of a spouse? 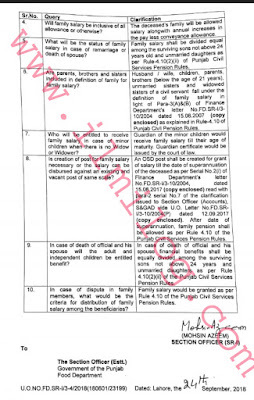 Family salary shall be divided equally among the surviving sons not above 24 years old and unmarried daughters as per Rule-4 10(2) (X) of Punjab Civil Services Pension Rules. Query No. 6: Are Parents. Brothers and 'Men Included in the definition of family for family salary? Husband/wife, children, parents, brothers (below the age of 21 years). unmarried sisters and widowed sisters of a civil servant fall under the definition of family salary in light of Para-3(A)8(13) of the Finance Department's letter No.FD.SR-U3- 10/2004 dated 15.08.2007 (copy enclosed) as explained in Rule4.10 Of Pun ab Civil Pension Rules. Query No. 7. Who will be entitled to receive the family salary in case of minor children when there is no Widow or Widower? Guardian of the minor children would receive family salary till their age of maturity. Guardian certificate would be issued by the court of law. Query No. 8. Is creation of a post for family salary necessary or the salary can be disbursed against an existing and vacant post of the same scale? An OSD post shall be created for grant of salary till the date of superannuation of the deceased as per Serial No.2(I) of Finance Departments letter No.FD.SR-1/3-10/2004, dated 15.08.2017 (copy enclosed) read with para-2 serial No.7 of the clarification issued to Section Officer (Accounts). S&GAD vide U.O. Letter No.FD.SR-1/3-10/2004 (P) dated 12.09.2017 (copy enclosed). After the date of superannuation, the family pension shall be allowed as per Rule 4.10 of the Punjab Civil Services Pension Rules. Query No. 9. In case of death of official and his spouse will the adult and independent children be entitled to benefit? In case of death of official and his spouse financial benefits shall be equally divided among the surviving sons not above 24 years and unmarried daughters as per Rule 4.10(2)(1i) of the Punjab Civil Services Pension Rules. Query No. 10. In case of dispute in family members, what would be the criteria for distribution of family salary among the beneficiaries? 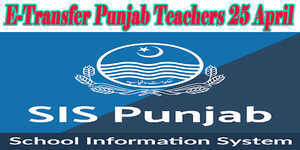 Family salary would be granted as per Rule 4.10 of the Punjab Civil Services Pension Rules.